Today was a Barrow milestone. Grant, a 3rd grader, became the 1st student to print his own design on our new Makerbot Replicator 2. Grant’s class has been studying rocks and minerals. As a part of the study, they skyped with Aurum Studios, a jewelry store in downtown Athens. During the Skype, Aurum toured students through the design process of a piece of jewelry. One piece of designing is to use 3D software to create a model. Students used a free tool called Sketchup and began to design their own gems with all of the cuts that they would design into a piece of jewelry. Ashley Maher, Spectrum teacher, worked with these students and gave them space to explore the many functions of Sketchup. Many of them figured out several functions of the tools within Sketchup by just exploring on their own. 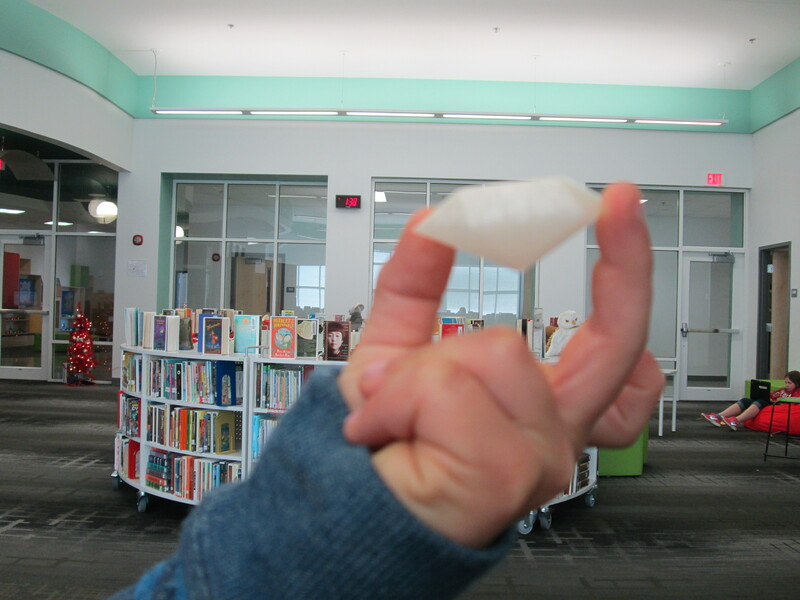 The students started this project before we even knew we were getting a 3D printer, but when we did, they had an ultimate goal of holding their gems in their hands. Ms. Maher took Grant’s Sketchup gem as an experiment to see if we could print it. We used this post for guidance. Basically, a plugin had to be downloaded into Sketchup in order to save the Sketchup files as an STL file. Next, the STL file was imported into Makerware. The gem was rotated so that the flattest side was on the build plate. We set the file to a 15% infill with no raft. Finally, the file was loaded onto the SD card ready for Grant to print. Today, I checked in with Grant to see what color he wanted his gem to be. I had his natural filament loaded and ready when he came to the library for ELT. He was eager to see what happened. I reminded him before we started that this was all an experiment. If it didn’t work, we would look at our mistakes and try again. We pulled up his file on the Makerbot and he pressed the red M to begin. The rest of his classmates were in the library working and they frequently came over to visit. We watched as the 3D printer built layer upon layer perfectly. It took about 35 minutes for his gem to print. Along the way, we made some video and Grant talked about his design as he watched it appear. As the gem neared completion, Grant was bouncing around shouting out the percentage because he knew we were so close to finishing the print without a mistake. When the build plate lowered and his gem that he designed was sitting their, he was ecstatic. His classmates rushed over and everyone wanted to hold it. He passed it around and then took it to show a few adults in the building. This entry was posted in makerspace, technology and tagged 3D printing, Aurum Studios, design, gems, makerbot, makerspace, rocks and minerals, sketchup. Reblogged this on Web Bloggers Yellow Engineering 2.0+. A third-grader at Barrow Elementary School has printed the first student-designed item on the media center’s Makerbot Replicator 2. It’s a simple design that turned out great!